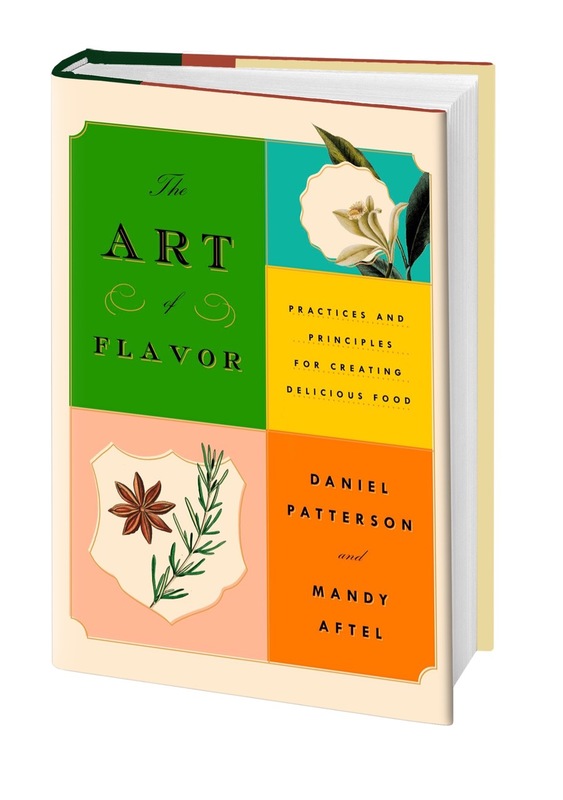 The Art of Flavor--Happy Pub Date! The Art of Flavor: Practices and Principles for Creating Delicious Food I have lived my entire life, for as long as I can remember, following my nose and devoted to flavor. Aroma and flavor are everything to me. So I can't help feeling that this treasure of a book, by my friends renowned chef Daniel Patterson and perfumer extraordinaire Mandy Aftel, was written with me in mind (and all of you who are reading this). Some of the best and most inspiring meals I've ever had were at Daniel's former restaurant Coi, in San Francisco, and in his home. Such is my esteem for Daniel, that years ago I flew to the west coast to make his wedding cake and it became the most beautiful photo in my book Rose's Heavenly Cakes. I refer to it casting cake on the water. I met Mandy at Daniel's wedding and have been following her magical work ever since. She even created a special perfume for me based on my favorite aromas. And I dubbed her a woman of uncommon scents. Their new book, The Art of Flavor, is beautifully written in one voice as a result of the perfectly harmonious blending of the two authors' highly tuned sensibilities. I am reading my way through the entire book as one would a novel, and learning so much. It's hard not to fill this posting with quotes from the book, because this book speaks for itself, so I will choose just a few of my top favorites: from Flavor Facets: ...The flavor of a given ingredient is determined not by one or a few dominant molecules but by an entire constellation of what might be hundreds of molecules, some of them present only as traces. Becoming alert to the unique possibilities of a given ingredient means becoming aware of its nuances as much as its overall character. We call these nuances facets. Mandy thinks of them as little wings attached to the ingredients. I also love The Four Rules of Flavor, each of which precedes recipes that exemplify it: An ingredient doesn't start to become a dish until it's combined with other ingredients. But how do we choose them? 1. Similar ingredients need a contrasting flavor. 2. Contrasting ingredients need a unifying flavor. 3. Heavy flavors need a lifting note. 4. Light flavors need to be grounded. Along with the poetic and defining descriptions of ingredients is invaluable information on what they contribute to a dish. Here is an example from the headnote of what is so far my favorite recipe cooked from the book: Duck Breasts with Endive, Honey, Cinnamon, and Basil: Duck breast is a slightly gamey, extremely flavorful, and versatile ingredient that has more in common with red meat than with chicken and most other poultry, and requires stronger accompaniments....glazed with a mixture of honey, vinegar, cinnamon, salt, and black pepper....The honey rounds out the vinegar, making it less aggressive, and the vinegar takes away some of the sweetness of the honey, leaving the floral, aromatic notes on the top. Endive lends a welcome bitter note. Yes! I will now always make duck breast with this glaze! And another winner: Orecchiette with Stewed Broccoli, Olive Oil, and Parmesan: ....chopping the broccoli into small pieces and stewing them slowly and completely bring out their sweetness. The broccoli melts into the sauce and creates a lock with the lemon and olive oil to make a merged, delicious whole....Thin slices of raw, crunchy broccoli stem add a welcome contrasting freshness and texture. They did indeed! The Art of Flavor is a treasure. It is so much more than just another recipe book--not only is it filled with enticing recipes, it is an ode to the understanding of flavor and will empower you to cook with a new freedom, confidence, and enjoyment.